Doylestown Borough-based The Verrichia Co., a commercial development and retail management company, got approval to develop the land in January. “The acquisition of these three parcels allows us to move forward with the development of Horsham Village Plaza, which will bring not only an improved shopping experience and selection, but also exciting dining opportunities for the community,” said Tom Verrichia, president and CEO of TVC. 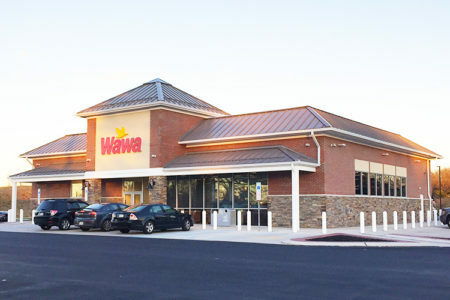 A 5,585-square foot super Wawa planned for the site will have six fuel pumps, allowing for 12 vehicles to fuel up at once, and a 12,900-square-foot CVS pharmacy will have a drive-thru. Three additional pad sites that total 17,200 square feet also are available for lease. Once the current structures at the site are taken down, TVC will begin grading the land for future construction, but the developer cannot begin construction until the final paperwork between the company and the township is settled. Construction is expected to start early in 2018, and the Wawa and CVS are expected to open that year. Both Verrichia and Bill Walker, Horsham’s manager, said that the project is on schedule and neither expects any hangups. That office park, or Business Park District, as it’s officially called, will be comprised of multiple parcels, as well as the Pennsylvania Business Campus, the Horsham Business Center and various properties and districts adjacent to those business parks. In 2015, Horsham’s council appointed a committee of council members and other government officials, as well as local civic and business leaders, to explore ways to revitalize the township’s business parks through the creation of a master plan. That plan was presented and approved by council on Jan. 13, 2016, and in it the committee emphasizes that the best way to invigorate the local business districts is through improvements to pedestrian and vehicular access, new land uses and sustainable energy and resource management. In addition to the residences and the former Intelligencer building, Horsham Village Plaza also formerly housed the Williamson Banquet and Event Center. The newspaper’s headquarters are in Doylestown Borough.